Per TechNet article (CAN, USA) Reuse a check number [AX 2012] environments that are on AX 2012 with the Feature Pack have the ability to enable the Allow Check Reuse feature in Cash and Bank Management Parameter for US and Canadian Companies. 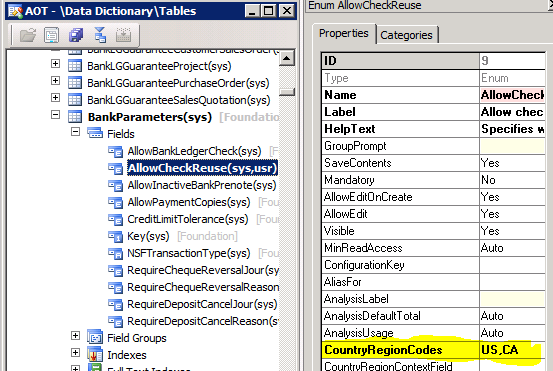 I wanted to provide information that will allow you to enable the Allow Check Reuse feature for Canadian Companies if you have updated to AX 2012 Feature Pack and do not see the option to enable Allow Check Reuse in Cash and Bank Management Parameters for your Canadian company. In order to enable the Allow Check Reuse for Canadian Companies the CountryRegionCodes that are part of the BankParameters table may need to be updated via the AOT. Please note that this is not a documented/tested HotFix so making the below changes will be at you own risk and testing should be done in a Sandbox environment prior to applying to a production environment. Add CA to the CountryRegionCodes along with US (US, CA). Compile to bring the changes into the environment. Below is a screenshot showing the properties window where the changes need to be made.